Uh-oh! Mr. Bungles drips jam on his tie at breakfast. His students play a trick on him at school. And the class hamster Nibbles escapes from his cage! Mr. Bungles and the class chase Nibbles through the halls and into town. But can they catch the hamster? The cover doesn't give this book justice. I thought the illustrations in the book were much better than the cover would make you think. It might just be that bright yellow. I enjoyed the story. I read it with Child #1 and he seemed to like it too. It's nice to know that teachers can make oopsies too! The book is written in rhymes. Calmenson sets you up with the first two rhyming echo word on the right hand pages. After that, the rhyme is echoed on the left page, giving the reader a chance to come up with the word before it's shown. I thought that was great so your little one could have practice with rhyming sounds. 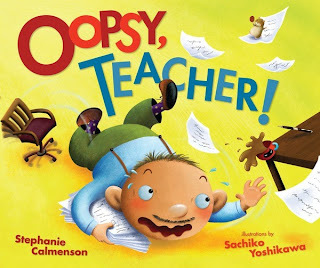 Calmenson has another Mr. Bungles book that I'd like to read as well called Late for School!